I’ve always been a little fuzzy on how to interpret grace notes at certain times, but the “Grace Notes” section in Michel Debost’s The Simple Flute (see p. 97) helped clear things up a bit for me by providing a few general (although not totally comprehensive) guidelines. A Baroque tradition that carried over to the Classical is to play a grace note before a trill, starting on the upper note, except when a chromatic progression is involved, or the upper note immediately present before the trill. the grace note is a third or more away from the note it is attached to. Also in the case of the third, the player may fill in the note in between the grace note and the note it is attached to. This is by no means comprehensive, but simply intended as a starting point. And as with all music, the best way to absorb the style (and grace note interpretation is part of style) is by doing a lot of listening to that style. The orchestra I’m a member of is preparing to perform the Rachmaninoff Piano Concerto No. 2 in a couple of weeks. The flute solo at the beginning of the 2nd movement has been a surprising challenge for me. With most of it written in the middle register, I can’t get away with relying on the “singing” register of the flute, which lies a little above that. So I’ve really had to work out my middle register embouchure and am finally achieving a more desirable sound now. My other problem is that for some reason, I can’t naturally feel which notes should receive more vibrato than others. This clip on YouTube helped me out a bit. In this video, the 2nd movement begins around 2:18, and the flute solo around 3:08. The feeling is of simplicity. The player applies vibrato to all the notes, and never does he push the sound or create too much intensity. I’m finding that if I keep my fingers right on the keys, it minimizes the potential for the sound to break crossing from the first note (B4) up to the second note (E5). Also, playing with a feeling of the palate being raised helps keep the sound light and from going flat. (Think “raised eyebrows!”) Thinking of the embouchure as being very forward, yet maintaining a fair amount of “pucker,” seems to prevent the sound from becoming fuzzy. 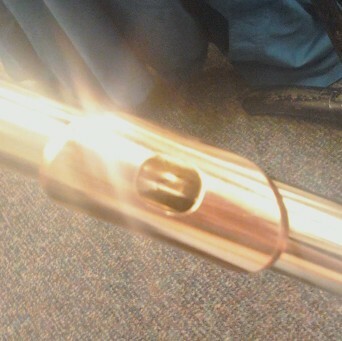 It’s easy to lapse into a lazy and unclear embouchure in this register. In my orchestral experience so far, this has been my favorite piano concerto. With a reasonably talented soloist, it really is a treat just to be part of performing this beautiful and colorful concerto.